It’s been a while since I’ve done a terminology post, and I’ve got a fun one today. Remember how I posted two images of Madge Bellamy, one in full Edwardian curves, one in slim, flattened ’20s? 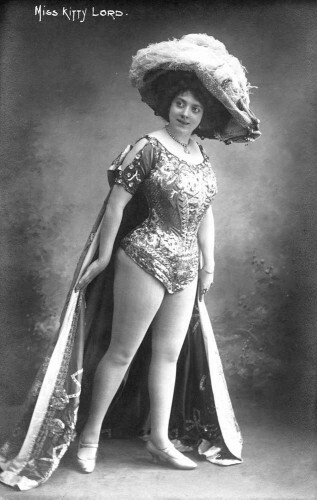 Madge’s curvy Gibson Girl silhouette was achieved with corsetry and padding above and below. Extremely voluptuous (if fake) figure were the desired look throughout the late 19th century and for the first decade of the 20th, and actresses like Madge often found such curves a useful attribute in advancing their career. As we can see from Madge, these curves weren’t always real. 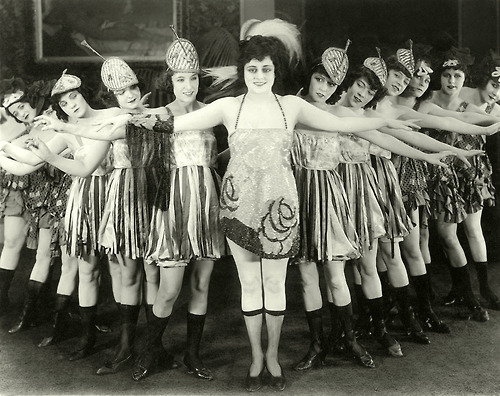 It’s not that hard to fake curves in a dress, but what if you were a chorus girl, expected to show off your legs? Or an actress given a role that demanded a little more exposure? Enter symmetricals. Symmetricals were knit tights that were padded to create full calves and thighs, instantly giving the effect of voluptuous curves from the waist down. Some of them looked enviously at the fat calves of the flunkies. Some regarded their own with apprehension. They were padded outrageously, and everyone knew it, but as long as the ‘symmetricals’, as stage people call them, did not get out of place it did not matter. Oh, fascinating! I’ve heard that in the eighteenth century, men wore bran-filled false calves and padding to enhance their legs if they didn’t look to advantage in stockings and knee breeches, and that this was still used by footmen in the 19th century. Can’t remember where I read it now though…. Exactly! And the first thing I thought of was drag queens padding in order to give womanly curves. I didn’t know that footmen were padding their calves in the 19th century! Wow! Do they have “anti”symmetricals! 😀 I would love to go from my current Edwardian curvy look, to the 20’s waif that seems to be in style these days! haha! Amen to that. I’d do anything to get rid of my curves. This is fascinating. I knew padding was used a lot, so for example ladies would get a corset sized for their real waist and then pad the top and bottom with cotton wool, but I didn’t know they used padded tights as well. Similarly, I knew gentlemen in the 18th century padded their stockings so their calves would look bigger, but I had no idea people were still doing that in 1893. These terminology posts are so educational! Fascinating! I wonder when the concern with ‘correct’ body image really started? Can we blame the Greeks, with their obsession with the bodies of athletes? Hard to fake it, in a teeny swathing of cloth. The earliest I can get to, out of my head, is Shakespeare, and poor Malvolio, down-gyved – presumably because his scrawny calves were not curvy enough to hold up the ties. So next time I feel unhappy about my own very very “seductively either thighs” I can stick my nose in the air and remind myself that “they’re Edwardian period authentic”? Neat! “Rounded”. Not “either”. Stupid autocorrect. padded thighs! I think we humans are all mad…. Interesting, where did the name come from? Skinny thighs aren’t asymmetrical any more than full ones are. Just hilarious! I would love to see a pair not on a human. Fascinating! Thanks for the post. I’ve wondered how the flattened, flapper look was achieved, but it never occurred to me that such lengths were gone to on the other end of the spectrum. I was soo born in the wrong era. I would have knocked miss kitty lord into a cocked hat with my figure. lol! I love 20’s style but it doesn’t suit me…so I go for the transition fashions more. Dresses with the drop waist but more frufru and ruffles on the skirt rather than stricght up and down. btw. love her shoes just the right heel hight for me. Padded calves! I would have never guessed. For those really concerned about chicken legs. I don’t understand how all of these folks weren’t sweating profusely all the time. So what was the Edwardian position on cankles? Cankles? Hmmmm…there was definitely a bit of an emphasis on neatly turned ankles and small feet, so really, you were supposed to look like one of those Christmas ornaments that is pointy at top and bottom and really full in the middle.